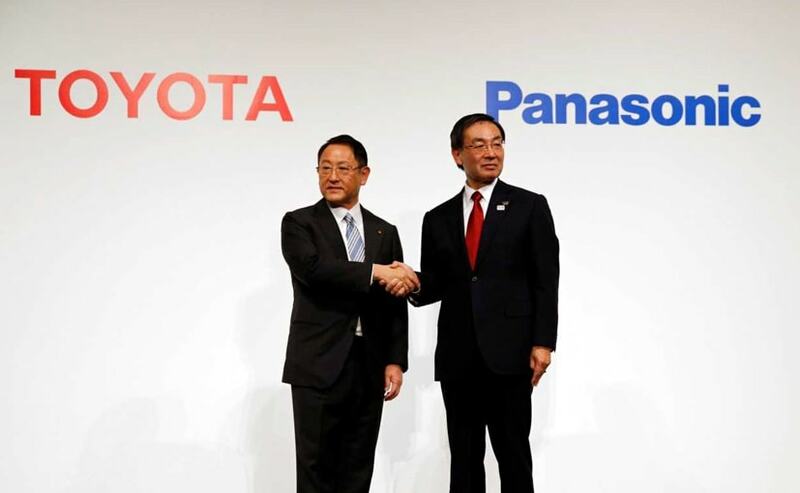 The joint announcement builds on an existing agreement under which Panasonic makes batteries for Toyota's petrol-electric and plug-in hybrid vehicles. Toyota Motor Corp is considering making batteries for electric vehicles (EV) with Panasonic Corp, as it ramps up battery development to help meet its goal for green cars to comprise half of global sales by 2030. The joint announcement on Wednesday builds on an existing agreement under which Panasonic - a global market leader for automotive lithium-ion batteries - makes batteries for Toyota's petrol-electric and plug-in hybrid vehicles. The plan to co-operate more closely on batteries comes as automakers compete to develop more EVs in compliance with tightening regulations worldwide to reduce vehicle emissions. Toyota's battery needs are likely to increase after it said last year it would add fully electric vehicles to its product line-up in the early 2020s, expanding a green-car strategy which has focused on plug-in hybrid and fuel-cell vehicles (FCV). "The auto industry faces many hurdles to developing next-generation batteries which are difficult for automakers or battery makers to tackle on their own," Toyota President Akio Toyoda said at a joint news conference. "It would be difficult for us to meet our 2030 goals given the current pace of battery development. That's why we're looking to Panasonic and other companies to help us develop ever-better cars and batteries."